Andy Fincher has been and always will be a fan and supporter of the English professional football team Wolverhampton Wanderers Football Club commonly referred to as the Wolves. This lifelong passion led him to write “Growing Up With Wolves” (published by Xlibris UK). The book is about why Fincher chose to support the Wolves over any other club and his time spent following them all over the country and abroad through good times and bad for the past 50 years. From the Wembley Cup Finals to their successive relegations. From playing in Europe to playing at Scarborough, the book covers many of the experiences Fincher have had over that period, plus one or two of his own observations about the game, controversial as they may be. Through the publication of “Growing Up With Wolves,” Fincher hopes Younger readers may learn things about the history of the Wolverhampton Wanderers Football Club and older readers may have memories brought back of matches from yesteryear. 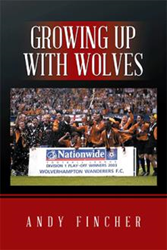 For more details about the book, please visit https://www.amazon.com/Growing-Up-Wolves-Richard-Hinton/dp/1543492134. Born in Worcestershire, Andy Fincher lived and worked there all his life. He is 59 years old. His other sporting interests include horseracing, rugby and boxing.